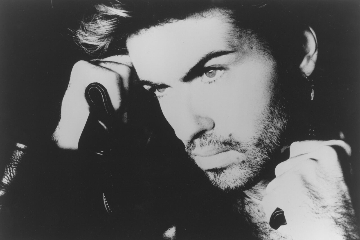 Freedom is the creative brainchild of George Michael and David Austin (George’s long term creative partner). In 2014 Sony were preparing to embark on the re-release of Listen Without Prejudice for its 25th anniversary and George true to form and ever reluctant to promote decided he would make a feature film to support the release. Initially the film was to explore his Listen Without Prejudice album with a focus on the iconic video for Freedom ‘90 directed by Oscar nominee David Fincher and featuring the world’s top five supermodels, Cindy Crawford, Linda Evangelista, Naomi Campbell, Christy Turlington and Tatjana Patitz. It soon became very apparent that there was a bigger and far more complex subject matter to deal with than just the LWP album. The story needed to encompass George’s early career, the record releases leading up to Listen Without Prejudice, the infamous ‘High Court’ battle, George Michael V’s Sony where George fought the corporate giant on ‘Restraint of Trade’ and the standard recording contract. Then there was the aftermath of the Sony years too. George also wanted to talk about his own sexuality and to share the story of his love and loss of his partner Anselmo Feleppa who was terminally ill at the time, later tragically dying from an HIV related illness. Finally, in his own words George wanted to put the record straight about some of the more topical incidences in his life such as his very public ‘coming out’ and the now infamous LA arrest in a public toilet. It all needed to be told. Freedom was never going to be a standard music documentary. It was to be a visual, cinematic and musical experience. FEATURING: George Michael, Stevie Wonder, James Corden, Sir Elton John, Mary J Blige, Jean Paul Gaultier, Ricky Gervais, Tony Bennett, Nile Rodgers, Mark Ronson, Naomi Campbell, Cindy Crawford, Christy Turlington, Linda Evangelista, Tatjana Patitz, Clive Davis, Liam Gallagher, Tracey Emin, Emmanuelle Alt, and more.